Don’t you love recipes that are easy, delicious, and at least mostly good for you? 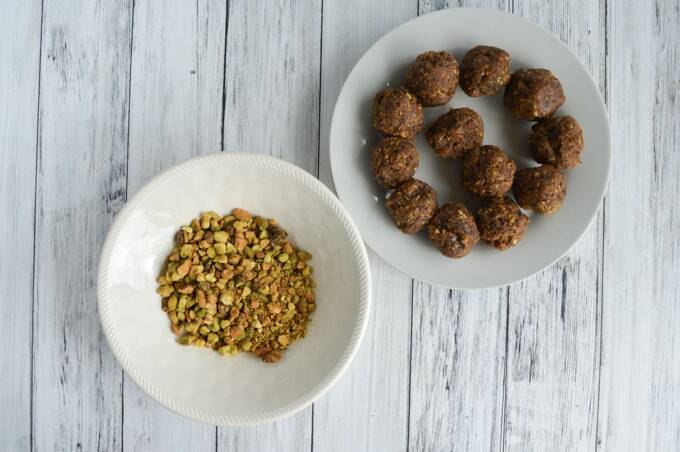 Dates do have a lot of natural sugar, but these snacks are just about as close to healthy as a decadent treat can get! 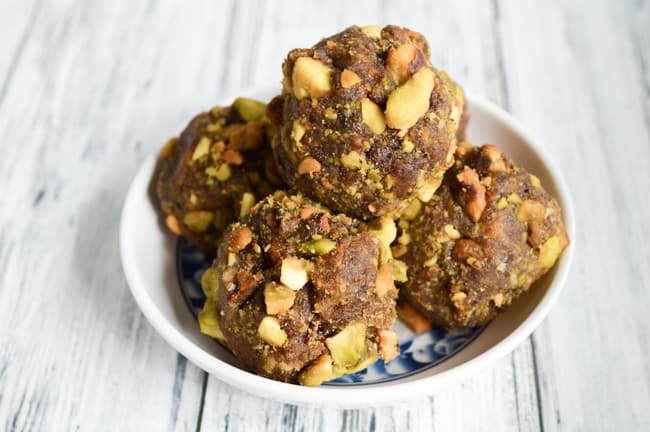 Made with only dates, cacao nibs, and pistachios, they are Paleo, as well as vegetarian & vegan-friendly. They’re easy to whip up, and even easier to enjoy! Especially with coffee. 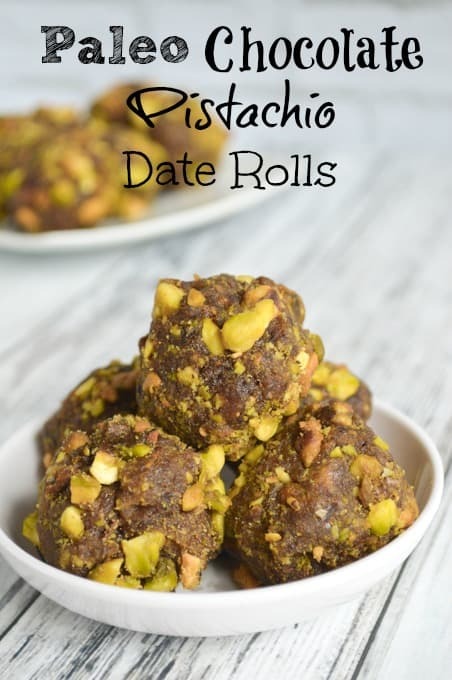 Man, these pistachio date rolls go great with coffee. These chocolate pistachio date rolls are based on mersu, an ancient Mesopotamian treat that has been made for about 4000 years. Only, of course, those ancient mersu didn’t have cacao nibs because chocolate is New World thing! I’ve previously warned that eating a handful of cacao nibs isn’t the same thing as chomping down on a bunch of chocolate chips (they’re both more bitter and better for you), but the dates are naturally so sweet that the finished date rolls don’t taste bitter, at all. 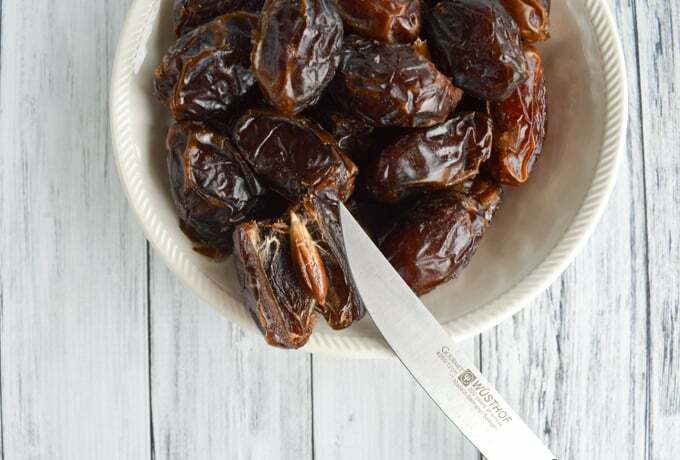 While you can use pre-pitted dates, I highly recommend taking a couple extra minutes to pit Medjool dates, instead. Medjool dates always seem larger and more juicy than whatever I get in those pre-pitted packages! Sometimes you can find them in bulk at health food stores, but they also have them at my local Costco. Score! If you don’t have a health food store or a Costco nearby 1) I’m sorry and 2) they are are on Amazon. Oh, and, no, it isn’t a typo – shelled pistachios are in the ingredient list twice! Pitting Medjool dates is actually pretty easy. Just carefully cut into one, lengthways, with a sharp knife. When you feel the knife hit the pit, stop trying to cut! Peel the date open and pull out the pit. Your hands will get a little sticky, but it won’t take long. Make sure you pack your pitted dates into the measuring cup so they’re fairly flat. I typically use 16 or 17 large dates for this recipe, but you may have to use more or less to make a cup, depending on how big your dates are. I made each date roll from about one heaping tablespoon of the date mixture and made a total of 12 rolls. If you make smaller rolls, you’ll have a larger number of finished date rolls and vice versa. It’s totally up to you how big you make yours! I think a tablespoon is a good size, though. Put the 1/4 cup of pistachios in your food processor and pulse until they're broken into small pieces, but not totally pulverized. These pistachios are what you will roll the date balls in. Remove the chopped pistachios from your food processor and reserve them for later. Add the 1/2 cup of pistachios to you food processor and pulse a couple times to break them into smaller pieces. Add the dates and cacao nibs and process until the dates are totally mashed and everything forms a big, sticky ball in the food processor. Measure the date mixture out with a tablespoon or small cookie scoop. With slightly damp hands, form each dollop of date mixture into a ball. Rinse/re-wet your hands as needed. Roll each ball in the reserved pistachios, making sure to press the pistachios into the date roll with your hands. Eat and enjoy! Store the date rolls in an airtight container in the fridge to keep them fresh for several days. These date rolls are so delicious – I really need to make more! I think they’d be tasty with other nuts, too, or even with coconut. They’re a great way to satisfy a sweet tooth if you’re trying to avoid processed sugars, and they the nuts have fat and protein that help balance out the dates’ sugar content. What’s you’re go-to “healthy” snack?